Today we look at one of my favorite services, G Suite and why I think it is a no-brainer and a must have for nearly all brands and businesses. How does G Suite work? What are the key features and benefits of using G Suite for brands and businesses? How do you install or get started using G Suite? G Suite is an all-in-one office and productivity suite made by Google for small and large businesses, education institutions and non-profits and anyone with a website or home on the web. G Suite is free to set up and $5/user/month or $60/year. G Suite is a bundle of services that you can sign into from any web browser in the world. It allows you to change the DNS settings of your domain so you can have personalized email ending in your website/url address. The DNS Settings you change are called MX Records. You change MX Records to point to Google. mikemurphyllc@gmail.com is not professional looking. It will work great as email service, but does not give good impression. Most host companies like GoDaddy, BlueHost, HostGator offer email as a service through the CPanel. It’s better than using a personal email, but still not as reliable as Gmail. You get the power of Gmail,for your business. Email is alive and well and the backbone of most businesses. Do not take it for granted and make sure you are using the most reliable and trustworthy solution. Gmail email service customized to your business or organization. Unlimited Aliases are the names before the @ symbol. Aliases are simple to create and incredible benefit. Add as many different domain names as you want for free under your GSuite account and create email addresses for any of them. Maybe your thinking about launching a new business or product, but want to test the waters. Add a new domain, point the mail servers to Google and now you have mike@thenextbigthing.com all under your $5/month account. GSuite comes with 24/7 support with really helpful Google folks. Every user gets 30 GB of free storage in Google Drive, which is similar to Dropbox. You can upgrade to $10/month for 1TB of storage for single users or unlimited storage for multiple users. G Suite has everything you need to replace programs like Microsoft Word, Excel, Powerpoint, etc and the beauty is you can access everything from any browser in the world and sharing and collaborating with anyone in your organization could not be easier. Share folders and files and never worry about saving or losing track of versions or changes. G Suite is more than just email and office apps though. Administrators can manage all of the settings, billing, and permissions for users. You can add or remove employees easily and set permissions and reset passwords and you can secure the organization files. G Suite basically gives you the power of a full IT department and it’s incredibly easy to maintain. There is a full App store that you can add on products, mostly for free and integrate with accounting programs and Client Resource Managers you may already use and just want to use with G Suite. Google + (the social network is nearly dead, but this is still very important for local discovery). G Suite Products are minimal and simple at first glance, but like most Google products, they pack a big punch without even realizing it. It takes many new users of Gmail and Docs, etc a little while to get used to it, but for reliability, dependability and ease of use, you can’t beat any of it. Sign up when creating your new website with Squarespace or WordPress.com or with Bluehost. at mikemurphy.co/gsuite for a 14-day trial and read through the instructions and go for it on your own. That’s how I learned. I will do it for you or your business and it usually takes 2–3 days to get it all done. 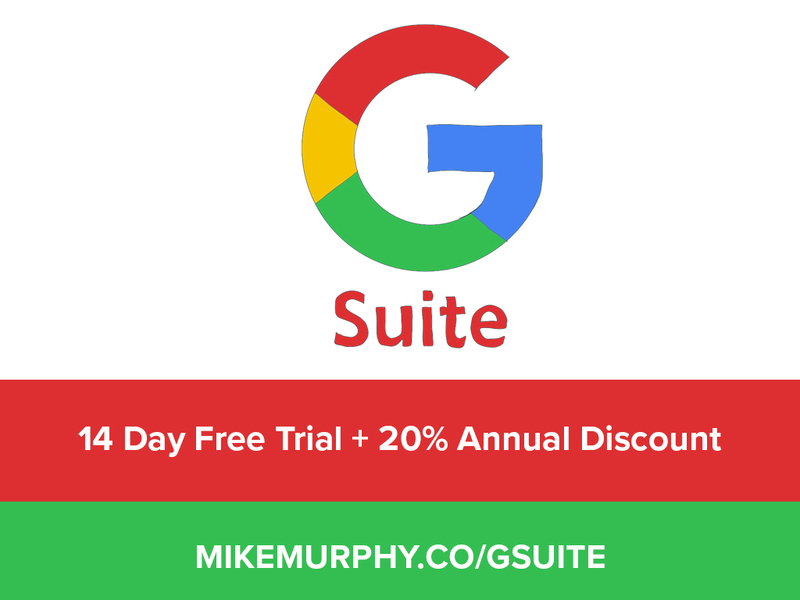 Go to mikemurphy.co/gsuite for 14-day trial.